Solving a system of linear equations means finding values for x and y that make both equations true. Type the equations as they appear in the problem with one equation per line. Solve each system of equations below. Enter the first equation: 2x - 3y = 7. Type the variable y by tapping the x variable key twice. Hit enter. ​Enter the second equation: 4x + 6y = 26. The solution is the ordered pair (5, 1). A system of equations can also be solved by graphing both equations and finding the point where they intersect. Set up Graph mode by selecting it from the Menu in the top left. Enter each equation in the input field and trace the graph to find the point of intersection by tapping the x- or y-axis and dragging the line that appears toward the point where the lines intersect. The x- and y-coordinates will be displayed on the graph. Enter the first equation: y - 2x = 1. Type the variable y by tapping the x variable key twice. Hit enter. ​Enter the second equation: 2y - 3x = 5. The solution is the ordered pair (3, 7). Set up Graph mode by selecting "Graph" from the Menu in the top left. Enter each equation in the input field. Trace the point of intersection by tapping the x- or y-axis and dragging the line that appears toward the intersection of the two lines. The x- and y-coordinates of the point will be displayed on the graph. Enter each equation as it appears in the problem with one equation per line. 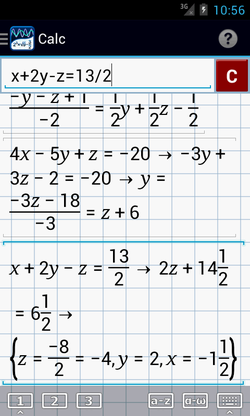 Solve each set of simultaneous equations in three variables below. Enter the first equation: 2x - 3y + 2z = 21. Type the variable y by tapping the x variable key twice and type the variable z by tapping the x variable key three times. Hit enter. Enter the second equation: 4x + 6y = z - 14. Hit enter. Enter the third equation: x + y - z = -5. The solution is the ordered triple (2, -3, 4). ​Enter the first equation: y - 2x + z = 1. Type the variable y by tapping the x variable key twice and type the variable z by tapping the x variable key three times. Hit enter. Enter the second equation: 4x - 5y + z = -20. Hit enter. Enter the third equation: x + 2y - z = 13/2. The solution is the ordered triple (–1 ½, 2, –4).